Formula cars are purpose-built, open-wheel race cars. They come in a variety of sizes and shapes which are dictated by specific “formula”, or specifications, unique to each class. Within RMVR there are three very active groups of formula cars which, on any given weekend, are run with considerable enthusiasm and skill. It’s not uncommon to have two different open wheel grids exceeding 20 cars in each! We often have dedicated races groups consisting of all Formula Vees (FV) or all Formula Fords (FF). Since FV and FF are spec engines (e.g. motors cannot be “souped up”) the open-wheel competition is extremely keen – a fact most apparent at the end of most races where first place is rarely more than a second over the 2nd place car. Qualifying times are often with hundredths of a second of each other and often several cars will be nose to tail at the finish line! You might believe that with such close racing, friendships would be rare within this group. Not so. These drivers are great friends, exemplifying the “Vintage Spirit”. Post-race “de-briefing” (aka BS) sessions will reflect the fun had by all while racing wheel to wheel. Someone break down? You’ll see all of them offering parts, help, or expertise to get them back on track in time for the next session. But then, that’s how it is within all of RMVR – Help is there for the asking. If you have questions about open-wheel cars or racing, a good resource is the RMVR Bulletin Board, specifically the Open Wheel Forum. Just post your questions. You will get answers. Also, names of people to help with specific formulas are listed below. 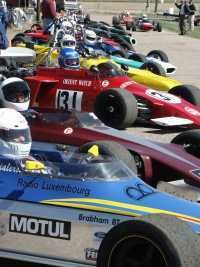 The three groups of formula cars are Formula Vee (FV), Formula Ford (FF) and Large Formula cars. For complete information on RMVR rules, and an application to submit a car for RMVR eligibility, see How to Apply for RMVR Car Eligibility, a detailed guide to RMVR’s eligibility process. This is a spec class based on components taken from the VW Beetle. That’s right, the beloved Bug is the basis for a formula racer. These cars use the stock front beam and rear suspension, wheels, brakes, transaxle and 1200cc (1385cc for RMVR) engine’ right out of the ordinary street car. Working within a serious set of established rules that limit changes to any of the parts, this is a low-budget entry level racer that is truly a “driver’s ability” class. It’s no wonder that racing greats such as Emerson Fittipaldi and Arie Luyendyk and Colorado’s own Indy 500 winner Buddy Lazier came from this class, establishing themselves with the ability to finesse a car to a win prior to having the horsepower to take them there. If you’d like to learn more about this very popular class, contact the Formula Vee Eligibility Team Specialist, who is here to help you with any aspect of FV racing. This is another spec engine formula class. FF uses the so-called Kent motor, a 1600cc, pushrod, four cylinder Ford engine. Chassis are tube frame with fully adjustable A-Arm suspension on all four corners. Once again, this is a “driver’s series” since engines cannot be tweaked to win with horsepower – it’s all about the driver’s ability to prepare and tune the car and it obviously makes for very exciting competition and camaraderie. 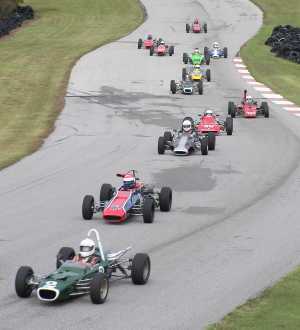 As with Formula Vee, many of the professionals now in major league open-wheel racing cut their teeth in a Formula Ford. Interested in driving Formula Ford? Contact the Formula Ford Eligibility Team Specialist, who welcomes your inquiries. These are the “big guys”. These formulas have larger engines and the cars usually have wings and slicks. There are a number of larger formula cars within this group. For instance, the FB class of cars are usually powered by the ubiquitous, and very powerful, 1600 TwinCam engines. Then there is it Formula Super Vee (FSV) which, like their smaller brethren, are powered by a larger and more powerful VW engine. And for the really power hungry formula racers, there are the huge F-5000 cars powered by big honking V-8 engines. Not for the weak of spirit or the beginner! As you can see, there is variety in the large formula car group. Contact one of the Large Formula Eligibility Team Specialists for answer to your questions.